St Michael’s Enniskillen are through to their third Hogan Cup final and their first since 2012 thanks to a richly deserved six points’ victory over Connaught champions St Colman’s Claremorris at Glennon Brothers Pearse Park on Saturday afternoon. 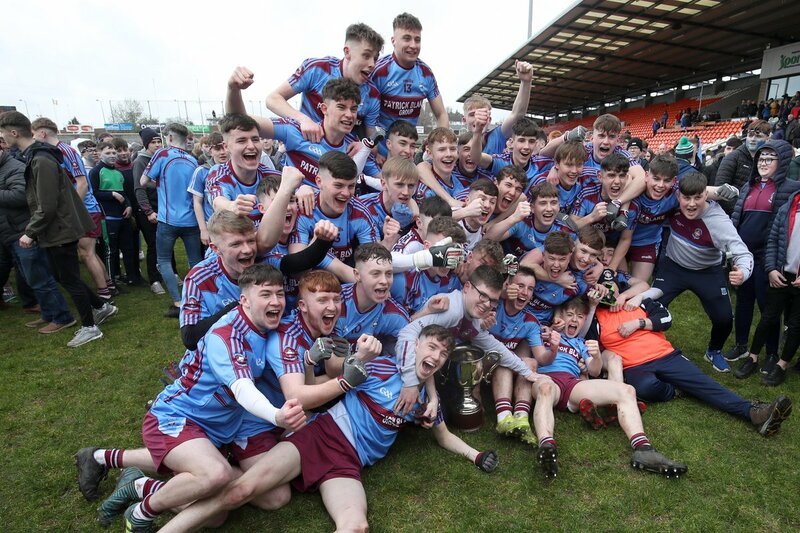 The Fermanagh lads picked up where they had left off from their Danske Bank MacRory Cup win as they rattled their opponents on their way to establishing an early ten points’ lead. St Colman’s were like rabbits caught in the headlights but gradually they played their way back into the contest and were only two adrift at the break. The third quarter was nip and tuck but when it was needed St Michael’s were able to step up a gear or two and they had that little bit more class in the end their opponents to set up a decider at Croke Park next Saturday against Leinster representatives Naas CBS. Once again this was a real team performance from Dominic Corrigan’s men with every one of them playing their part in the victory. Josh Horan, Ronan McHugh and Josh Largo Ellis were to the fore in defence while team captain Brandon Horan and Joe McDade got to grips at midfield in the crucial final quarter. Up front Darragh McBrien and Conor Love asked questions of the St Colman’s defence throughout, Caolan Duffy was superb in the opening stages while centre half forward Micheal Glynn was immense when the game was in the melting pot in the final quarter. A McBrien free opened the scoring before full forward Love doubled their advantage when he pulled on a loose ball to send it over the bar. The game was only four minutes old when Enniskillen seized on a poor kickout with Love flicking the ball to Duffy who finished low to the net past keeper Darragh Fallon. In the 10th minute Enniskillen already had a stranglehold on proceedings as Tom Keenan and Pol McKervey combined for Love to rifle the ball to the roof of the net. Duffy then weighed in with a great score and Glynn knocked over a free as everything that St Michael’s touched turned to gold. A free from full forward Conor McGuinness opened a shell shocked St Colman’s account but that was quickly cancelled out by a long range free from McBrien. That score though in the 16th minute proved to be Enniskillen’s last of the opening period. Matt Saunders, Ethan Henry, McGuinness, Niall Treacy and wing back Padraig Cummins all had points as the Mayo school enjoyed a purple patch. St Michaels were struggling at that stage but they could have had a goal in the 29th minute when they sliced open the Claremorris defence only for Luke Gallagher to clear the ball off the line. St Colman’s came straight down the field with Enda Hession beating his marker and firing past keeper Sean McNally to leave the scoreboard reading 2-5 to 1-6 at half-time and a brilliant turnaround from the east Mayo team. McGuinness had the opening score of the second period from another placed ball before McBrien ended St Michael’s barren spell with a wonderful effort from 40 metres out. Enniskillen won the next kickout and the ball was played into Love who left his marker for dead but Claremorris keeper Fallon pulled off an outstanding one handed save. Love then hit a superb point as Enniskillen upped the ante. McGuinness converted a free but McBrien and centre half back Ellis both registered to leave it a four point game going into the final quarter. McGuinness landed a quality free from out on the left wing to keep his side in touch before Glynn took centre stage. He hit his side’s next four points with two of those splendid efforts from play to break Claremorris’s resistance. With the game deep into injury time St Colman’s lost attacker Steven Nyland to a second yellow card offence but it had no effect on the outcome as the referee sounded the final whistle moments later. St Michael’s Enniskillen: S McNally, L Flanagan, G Cavanagh, J Horan, A O’Cathain, J Largo- Ellis (0-1), R McHugh, B Horan, J McDade, C Duffy (1-1), M Glynn (0-5, 3F), D McBrien (0-4, 2F), P McKervey, C Love (1-2), T Keenan. St Colman’s Claremorris: D Fallon, C Dixon, J Cummins, L Gallagher, E Henry (0-1), L Og Horkan, P Cummins (0-1), C Golding, S Keane, M Saunders (0-1), E Hession (1-0), N Treacy (0-1), J Jennings (0-1, F), C McGuinness (0-5, 5F), S Nyland.